For the Sparks album, see Interior Design (album). In ancient India, architects used to work as interior designers. This can be seen from the references of Vishwakarma the architect - one of the gods in Indian mythology. Additionally, the sculptures depicting ancient texts and events are seen in palaces built in 17th century India. "One of my strongest convictions, and one of the first canons of good taste, is that our houses, like the fish’s shell and the bird’s nest, ought to represent our individual taste and habits." Color is a powerful design tool in decorating, and interior design which is the art of composition, and coordinates colors together to create stylish scheme. Interior designers have knowledge about colors to understand psychological effects, and meaning of each color to create suitable combinations for each place.Combining Color also gives a certain state of mind, and has positive and negative effects. It makes a room feel more calm, cheerful, comfortable or dramatic. It also makes a tiny room seem larger or smaller. So it is the Interior designer profession to choose appropriate colors for a place in a way people want to look and feel in the space. 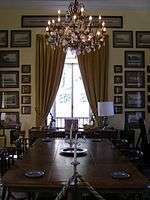 The interior of a private residence. An electric wire reel reused as a center table in a Rio de Janeiro decoration fair. 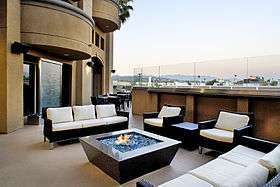 Commercial design encompasses a wide range of sub specialties. Retail: includes malls and shopping centers, department stores, specialty stores, visual merchandising and showrooms. Sports: includes gyms, stadiums, swimming rooms, basketball hall, etc. Other areas of specialization include amusement and theme park design, museum and exhibition design, exhibit design, event design (including ceremonies, weddings, baby and bridal showers, parties, conventions, and concerts), interior and prop styling, craft styling, food styling, product styling, tablescape design, theatre and performance design, stage and set design, scenic design, and production design for film and television. Beyond those, interior designers, particularly those with graduate education, can specialize in healthcare design, gerontological design, educational facility design, and other areas that require specialized knowledge. Some university programs offer graduate studies in theses and other areas. For example, both Cornell University and the University of Florida offer interior design graduate programs in environment and behavior studies. Within this program at the University of Florida, students may choose a specific focus such as retirement community design (under Dr. Nichole Campbell) co-housing (Dr. Maruja Torres) or theft prevention by design (Prof. Candy Carmel-Gilfilen) (Campbell, 2012, Personal Communication). In China, seldom does university offer Interior Design as a major, instead of offering one or two elective classes. As a result of losing official government supports education in Interior Design, requires people to take some tutoring classes from some private institutions, if they are interested in this area and want to study. However, the educational quality is poor. On the other side, the certification test of interior design in China is different from US, because China only requires basic skills and knowledge. There are a wide range of working conditions and employment opportunities within interior design. Large and tiny corporations often hire interior designers as employees on regular working hours. Designers for smaller firms usually work on a contract or per-job basis. Self-employed designers, which make up 26% of interior designers, usually work the most hours. Interior designers often work under stress to meet deadlines, stay on budget, and meet clients' needs. 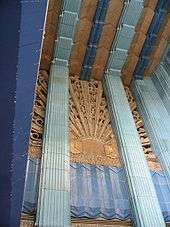 Terracotta Art Deco sunburst design above front doors of the Eastern Columbia Building in Los Angeles; built 1930. "Modern design grew out of the decorative arts, mostly from the Art Deco, in the early 20th century." One of the first to introduce this style was Frank Lloyd Wright, who hadn't become hugely popularized until completing the house called Fallingwater in the 1930s. "Modern art reached its peak in the 1950s and 60s which is why designers and decorators today may refer to modern design as being "mid-century." 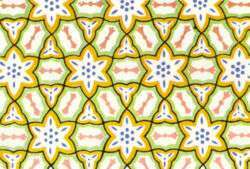 Modern Art does not refer to the era or age of design. "Modern art is not the same as contemporary design, which is a term that interior designers apply to a shifting group of recent styles and trends." 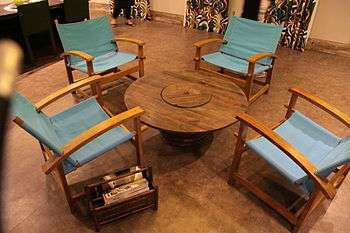 Modern designs is defined by its own trends which has gone unchanged for decades. Notable interior designers in the world today include Jonathan Adler, Michael S. Smith, Martin Brudnizki, Kelly Hoppen, Kelly Wearstler, Andrew Martin International, Nina Campbell, David Collins, Nate Berkus, Sandra Espinet, Jo Hamilton, Premdas krishna and Nicky Haslam. ↑ Blakemore, R.G. History of Interior Design Furniture: From Ancient Egypt to Nineteenth-Century Europe. J. Wiley, 2006, p. 4. 1 2 "Complete House Furnishers: The Retailer as Interior Designer in Nineteenth-Century London". Retrieved 2012-12-17. ↑ "Amanda Girling-Budd's Statement". Retrieved 2012-12-17. ↑ Clouse, Doug. “The Handy Book of Artistic Printing: Collection of Letterpress Examples with Specimens of Type, Ornament, Corner Fills, Borders, Twisters, Wrinklers, and other Freaks of Fancy”. Princeton Architectural Press, 2009. p. 179. ↑ Clive Edwards (2005). 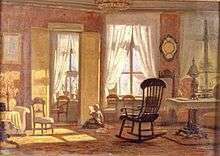 Turning Houses Into Homes: A History of the Retailing and Consumption of Domestic Furnishings. Ashgate Publishing, Ltd. Retrieved 2013-02-07. ↑ Gillian Perry (1999). Gender and Art. Yale University Press. Retrieved 2013-02-07. ↑ Flanner, J. (2009). "Archive, Handsprings Across the Sea". The New Yorker. Retrieved August 10, 2011. ↑ Munhall, Edward. "Elsie de Wolf: The American pioneer who vanquished Victorian gloom". Architectural Digest. Retrieved 27 October 2011. 1 2 3 4 5 Lees-Maffei, G, 2008, Introduction: Professionalization as a focus in Interior Design History, Journal of Design History, Vol. 21, No. 1, Spring. ↑ Plunket, Robert. "Syrie's Turn: Once, everyone read W. Somerset Maugham. But now his late ex-wife is the one selling books", Sarasota Magazine, 2006, v. 10. ↑ Pauline C. Metcalf (2010). 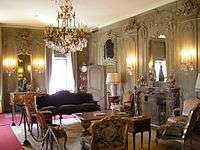 Syrie Maugham: Staging the Glamorous Interiors. Acanthus PressLlc. Retrieved 2013-02-07. ↑ "Color Wheel, Color Schemes, Color Therapy, Colors by Interiordezine". www.interiordezine.com. Retrieved 2016-10-19. 1 2 "The Psychology of Color for Interior Design – Interior Design, Design News and Architecture Trends". designlike.com. Retrieved 2016-10-19. ↑ "The Psychology of Color". HGTV. Retrieved 2016-10-19. ↑ "Industrial Design Industry Report". ibisworld.com. July 17, 2008. 1 2 Striner, Richard. "Art Deco: Polemics and Synthesis". WInterthur portfolio, Vol 25. No. 1 spring, 1990. PP. 26-34. ↑ Yang, Jian. "Art Deco 1910-39". Craft Arts International, 2003, Issue 59, PP. 84-87. ↑ Striner, Richard. ‘Art Deco: Polemics and Synthesis’. WInterthur portfolio, Vol 25. No. 1 ( spring, 1990). PP. 26-34. ↑ Yang, Jian. ‘Art Deco 1910-39’. Craft Arts International, 2003, Issue 59, PP. 84-87. 1 2 3 "About Modern Interior Design". Home Guides | SF Gate. Retrieved 2015-12-10. 1 2 3 Yunis, Alia, "The Majlis Painters," Saudi Aramco World Magazine, July/August 2013, pages 24-31. ↑ Mostyn, Trevor. 1983. Saudi Arabia. London: Middle East Economic Digest. Pages 257-258. 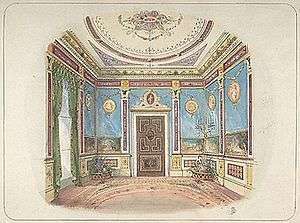 Wikimedia Commons has media related to Interior design.